What a wonderful storyteller Nevil Shute is. He may be old fashioned in his morals and language, but my goodness can that man tell a story. 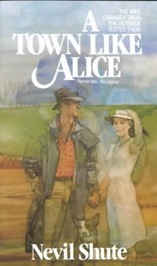 In A Town Like Alice (also released under the title The Legacy) Shute actually tells several stories. The first is that of his narrator, Noel Strachan. Noel is an elderly man whose involvement in the story is quite distant really. At the beginning of the novel he signs a client and writes up his will. Of course, the man dies and Noel has to go and find the heirs. But it’s just a few years post-war in England and people are difficult to find. Eventually, he discovers that Jean Paget is the only living heir—her mother (the client’s sister) died during the war and her older brother died as a prisoner of war in Malaya on the Burma-Siam railroad. It may seem like a roundabout way to introduce the novel’s central figure, but I always appreciated that Shute gave us time to get to know the narrator first because too often the narrator is just a disembodied voice and Noel is definitely a well-rounded character. Anyway, as Noel gets to know Jean (who has inherited enough money that she need not continue working if she doesn’t want) some of her story comes out. She too was a prisoner of war in Malaya (I use the names Shute does because it’s just easier), except that instead of being in a camp, she and 31 other women and children were sent marching all across the country. Over the course of their march, over half the party died from disease, exhaustion and tropical diseases. Jean, who had grown up in Malaya spoke the language and became their leader. After marching many hundreds of miles, the group suddenly runs into two Australian POWs who drive trucks. The more important of which is Joe Harman. Joe gets medicine for the women and tries to get them meat for their meals whenever he can. His last such offering is in the form of five black hens, which he stole from the Japanese army commander in Kuantan (a town on the southeast coast). For the theft, he is crucified and beaten and the women (who ate the chickens) are forced to watch. After that they leave Kuantan quickly and head north up the coast until their Japanese guard dies. Jean manages to negotiate, first with the village headman and then with the Japanese military, that the women be allowed to remain in the town, tending the paddy fields, until the war is over. So, after finding out about her inheritance, Jean goes back to that village to build a well and a wash hut for the women there, as a way to say thank you. And that is when she discovers that Joe survived the crucifixion. So off she goes to Australia to try and find him. Meanwhile, he was recently discovered that she was not married when they met (he assumed and she let him) and has taken off to England to find her. Instead he finds Noel who tells him a bit, but not that Jean is in Australia. Eventually, the two meet up, realize they are still very much in love and decide to get married. The only hitch is that Joe works on a cattle station in the outback, which is remote to say the least. There really isn’t anything in the local town. So, Jean decided to change that. It starts with a building and opening a shoe factory where girls can work (there are very few women in the town). But then she decides her employees will need something to spend their wages on, so she builds a small shop. Of course, everything goes from there. Essentially, she is building a town like Alice Springs (which is “a bonza town” according to everyone in the book). Besides the appeal of the story itself, it’s Shute’s ability to describe a setting that brings me back to this book. Rather than be exhaustive in his detail (there are no inventories of detail here), Shute gives bits and pieces of detail that give you enough information to visualize the place he’s describing without being told exactly what it looks like. He plays a similar trick with his characters. Although I always think of A Town Like Alice as a love story, a good half of the book takes place before Jean and Joe meet up again. So really, like the majority of Shute’s other novels, this is a story about the war and what happened afterward. But it’s a side of the war that hasn’t been tackled much in fiction, which makes it rather refreshing and really quite exciting to read.